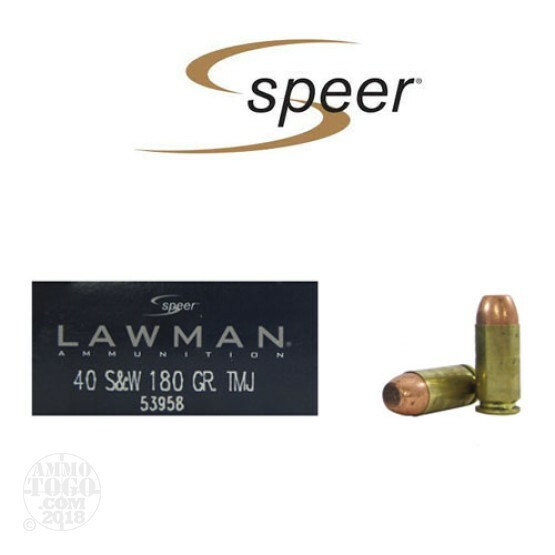 Engineered to deliver the same feel and point of aim as premium personal defense loads, Speer Lawman provides an affordable and practical way to train. Whether you are shooting paper targets or running repetitive tactical drills, these loads provide realistic training to give you the edge you need when duty calls. Perfect for the high-volume shooter, this package contains 1000 rounds of Speer Lawman .40 Smith & Wesson ammunition. Each round is loaded with a 180 grain total metal jacket (TMJ) projectile. Delivering all the performance of premium ammunition at a fraction of the cost, these rounds are ideal for range training and tactical drills. This factory fresh ammunition is boxer primed and 100 percent non-corrosive. Featuring high-quality, reloadable brass casings, each round produces a muzzle velocity of 1000 feet per second and a muzzle energy of 400 foot pounds.